NYC, 02/22/2019, 2:00PM. 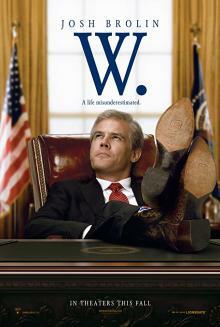 W. (2008): The story of George W. Bush by Oliver Stone. 129 min. Starring Josh Brolin, Elizabeth Banks, Ioan Gruffudd. W. had a budget of $25.1 million and grossed $25.5 million in North America, and $3.4 million internationally. The film appeared on some critics' top ten lists of the best films of 2008. Joe Neumaier of the New York Daily News named it the eighth best film of 2008, and Roger Ebert of the Chicago Sun-Times named it on his top 20 list (he did not assign rankings).